I am thinking of joining our local chapter of the American Sewing Guild. This year the group is working on making a Channel jacket using couture techniques. The leader, Jeanette, had ordered sheets of 26″x39″ tracing paper to use when making the muslin. 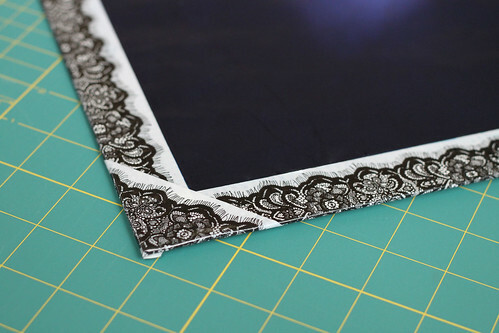 It is a carbon like paper I remember using during my days as a cutter in various costume shops. Every shop I worked in had this paper taped to boards. I bought a sheet to make it into a board. I found the board at Aaron Bros., then went next door to Osh Hardware to look for tape. Imagine my surprise when I found duct tape with a lace design on it. I love it and it made the board so pretty. Big sheets of transfer paper make it easy to copy patterns and mark long seam lines. It will be nice to have this new tool to copy patterns, especially ones from old Burda magazines. This entry was posted on Wednesday, January 16th, 2013 at 5:54 pm and is filed under Sewing and Tools. Tagged: Sewing. You can feed this entry. You can leave a response, or trackback from your own site. You definitely should join! Love the lacy duct tape! I saw your comment in my recipe page. We’re cutting out/down salt. I made the cheeseburger pie for supper today. It really needed the salt, otherwise it was really good. I am trying to resist the fancy duct tapes–trying not to collect more craft stuff–I like your use for it.